Looks pretty good so far I think. And the pattern is a joy to knit, simple but not too simple and as it’s knit on size 4 mm/US6 needles it progresses super quick I feel and that is always a good perk. 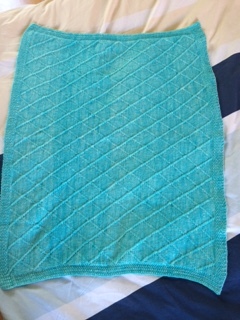 I’ve not forgotten about my baby blanket although it’s been on the back burner these past 2 days, but I really love how the pattern works out, I love the colour which I hope the parents will also like and feel is unisex. 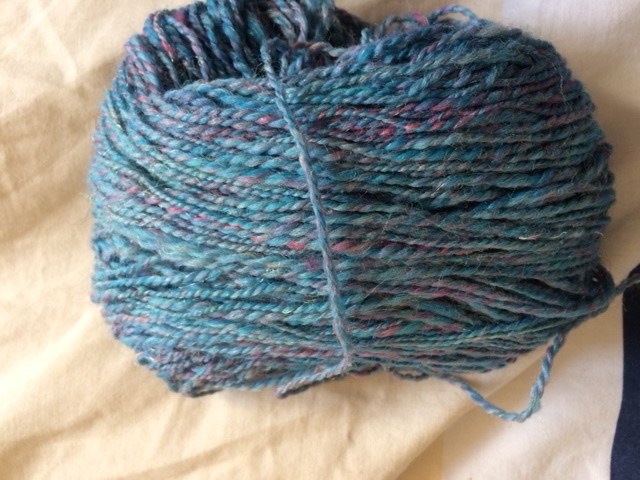 I just hope I dyed enough yarn….As I never write anything down but dye “to feeling” (if that is a thing). What do you think? 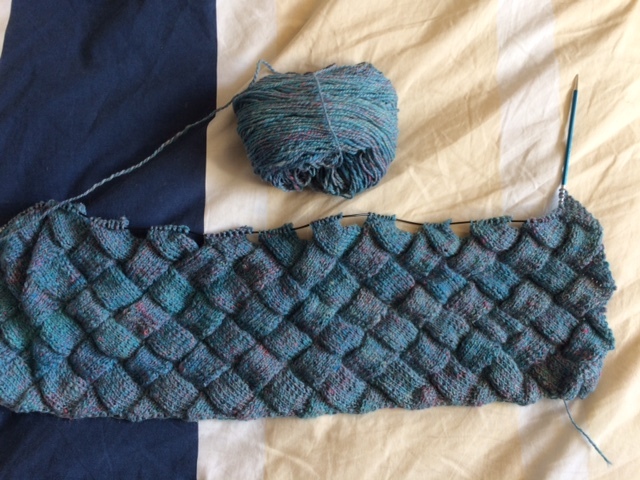 I do need to be careful to count my stitches because sometimes I stop and realize that I’ve crossed the stitches at the wrong place and I need to unravel a few stitches down a few rows. 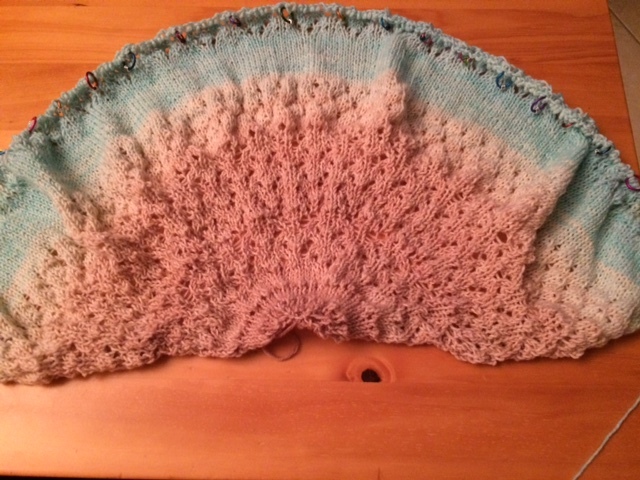 But so far so good, now I just need to be serious and continue so it will be finished in time for my little niece or nephew. I’ve also been doing some work for the I Knit Fandango show which is coming up in just a few days!!! Can you believe that!! I’m so excited and I look forward to perhaps meet some of you and to share with you here the pictures of my booth and so forth. 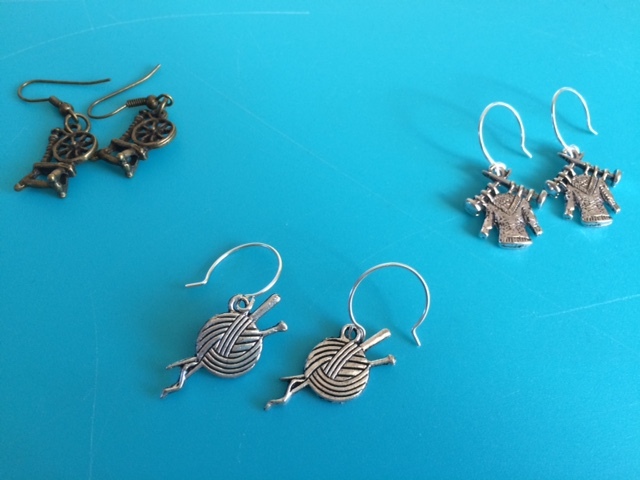 So i’ve been doing stitch markers and fibre crafts themed earrings. Do you like these? I think I may have a problem…with online shopping…..too much…..or…. And today I got the other two! The first set is sort of classic elegance I feel and this second set is more fun and full of colour. 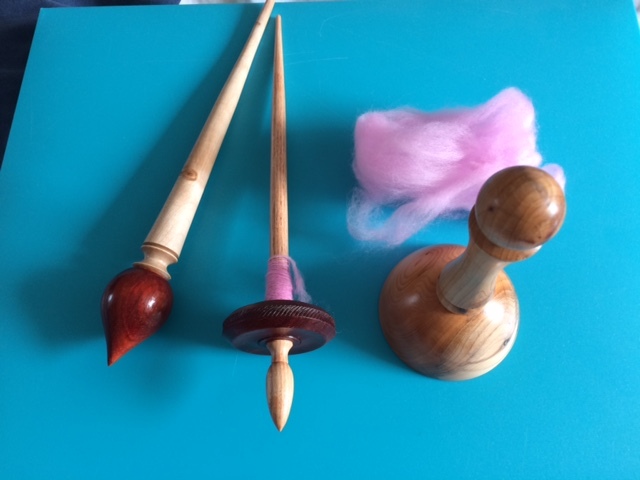 This second set comes from the USA, a shop called Woodturnerva and his work is gorgeous and the spindles are BEAUTIFUL! So this was the first happy package of the day. Now on to the second! So a few days ago I was browsing Facebook and came across a post from Jaala Spiro of Knitcircus. She was having a SALE the next day. I did think: hm, better NOT check that out tomorrow as I really don’t need any more yarn and plus I have this huge to knit list and promised myself I’d get it done before casting on for any more socks etc. But hey, who can stay serious and strong in front of a Knitcircus sale? Unfortunately, or not, I’m not one of those folks. So came the big day and off I went browsing! At the end of my daydreaming, shopping session I found myself with 3 items in my cart! And now they have arrived! So do you like?????? 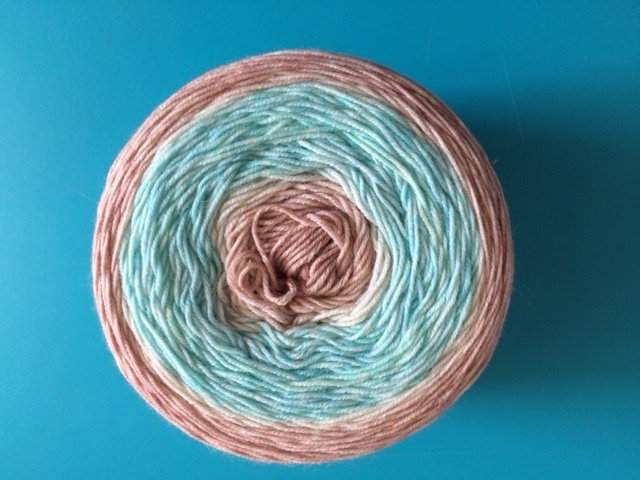 The first picture of the big brown and blue yarn cake is 150gr so lots of yardage there ( 600yds), the colourway is Sand Castle. 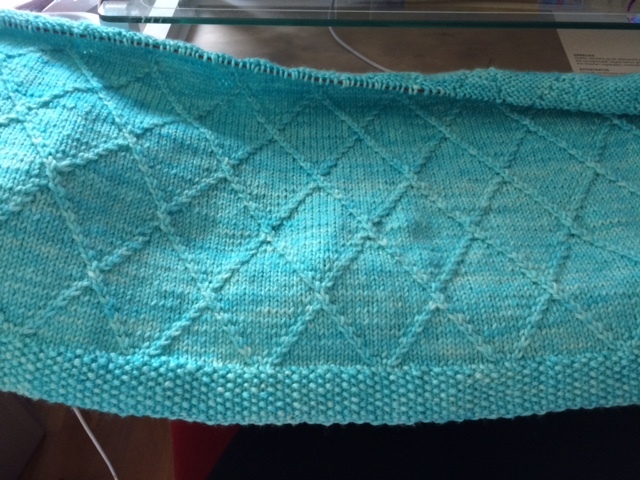 I’m thinking this one needs to be a shawl. The other two are regular size 100gr cakes with 400yds. The one on the left is Eat, Pray, Knit and the one on the right is Watermelon. 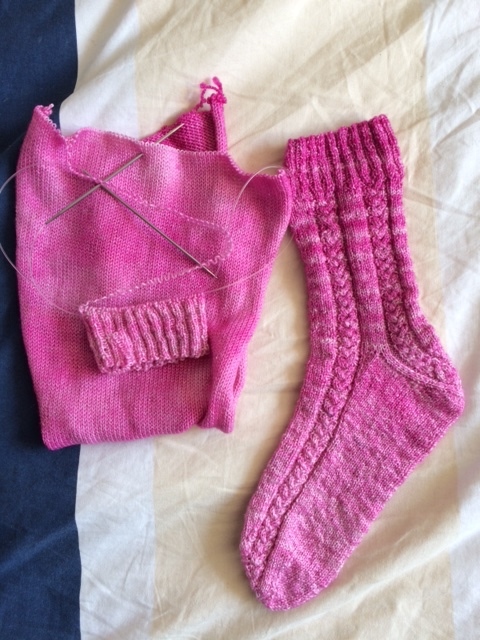 I love watermelon socks so I might knit this yarn first. 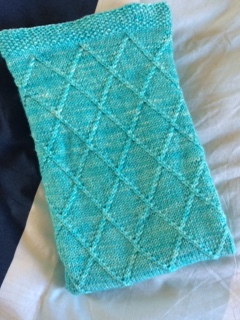 I’m thinking for the Watermelon, a simple pattern to let the colours really be the centerpiece of the socks. 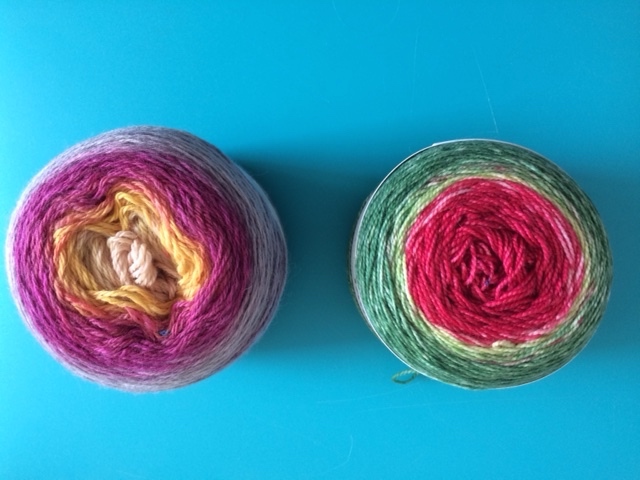 However, as this is just one regular size yarn cake, I wont be able to knit them 2 in 1 or if I do, one sock will be mostly green and the other mostly red but then I guess, even if I knit them one at a time that’s how they will be anyway. 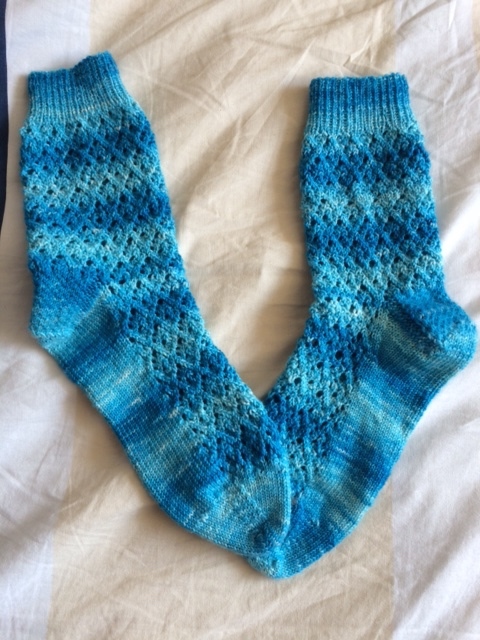 Do you think maybe I should use this for something other than socks? 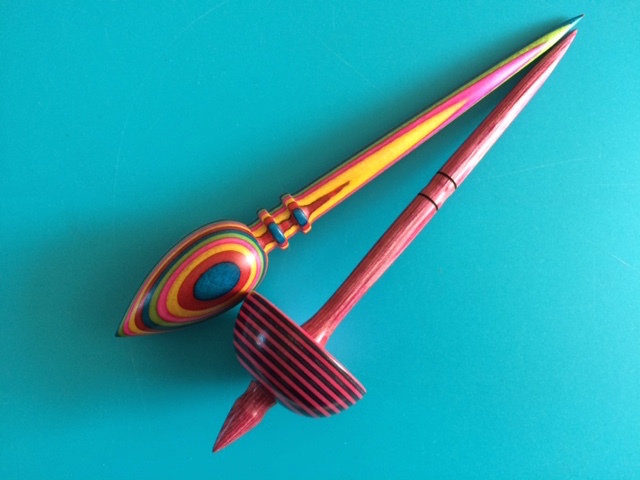 To let the gradient dyeing show? I hadn’t thought of this. 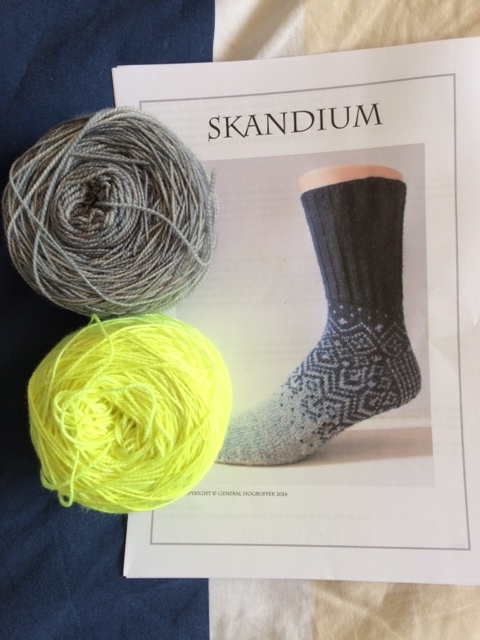 In her yarn club I receive 2 yarn cakes and that is why I’m able to do 2 identical gradient socks. Hm, guess I need to think this a little bit. 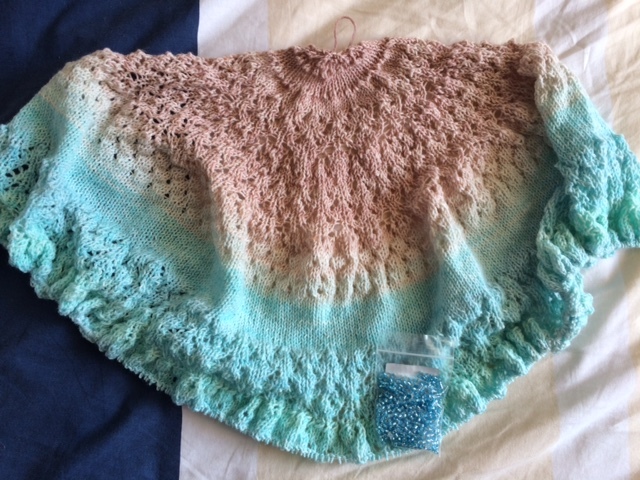 They say that 430 yards are needed which means that the smaller cakes are out of the picture and if I use the large one, I will have some left overs for a small pair of socks maybe unless I’m able to make the shawl bigger. This could be an idea I think. 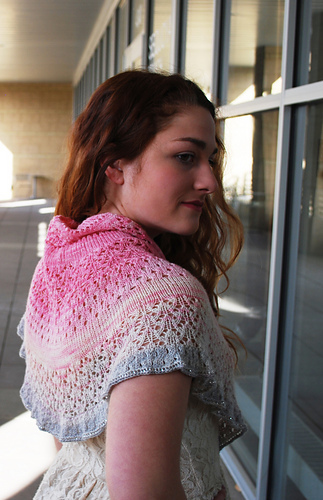 You can buy a kit from Knitcircus (pattern+yarn+beads/or no beads) or the pattern alone on Ravelry. Now on to the last happy mail day item! 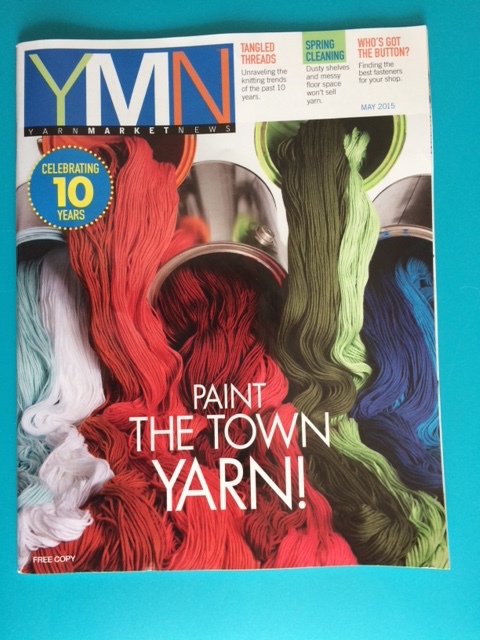 This is a magazine that is published for people in the yarn industry and it is super interesting as i can read interviews with interesting people, get information about the industry, get inspiration and so for so definitely a good read for me. I love this issue’s front picture.